The ongoing "risk-off" trade continues to dominate the agenda once again today. After yesterday's sharp sell-off, European stocks were struggling to rebound this morning and US index futures remained downbeat. As a result, both precious metals are higher for the second consecutive day amid safe-haven flows. These metals have found additional support from the fact major central banks have turned dovish again. After the Fed's U-turn last week, we have seen the RBA deliver a dovish outlook on interest rates and yesterday the BoE indicated that monetary policy in the UK will remain accommodative for even longer due to Brexit uncertainty. A few weeks ago, the ECB appeared a tad more dovish than expected. The fact that we are seeing major central banks turn dovish at the same time is probably alarming for some investors, which may explain why stocks have failed to sustain their rally. But this is good news for bonds and therefore noninterest-bearing and low-yielding assets such as gold and silver. What's more, with the Dollar Index having just completed a 6-day rally, you would think that these dollar-denominated metals would simultaneously be down for the same number of days. However, over the last six trading days, gold has only been down on three occasions, while silver has been down on 5 occasions, although higher today. So, both metals have outperformed, but more so gold than silver. The latter's slight underperformance is likely due to concerns over industrial demand for the metal. After all, we have seen consistently weak growth figures coming out of China, combined with recessionary numbers from Germany and not-so-strong data from other regions of the world. That being said, the fact that the major central banks have turned dovish, this should provide some support for both gold and silver for the foreseeable future. In fact, silver has been putting in a series of higher lows even before the Dollar Index topped out. Given the outlook for US interest rates to remain unchanged this year, we could see renewed weakness for dollar next week, and this could underpin precious metals further. 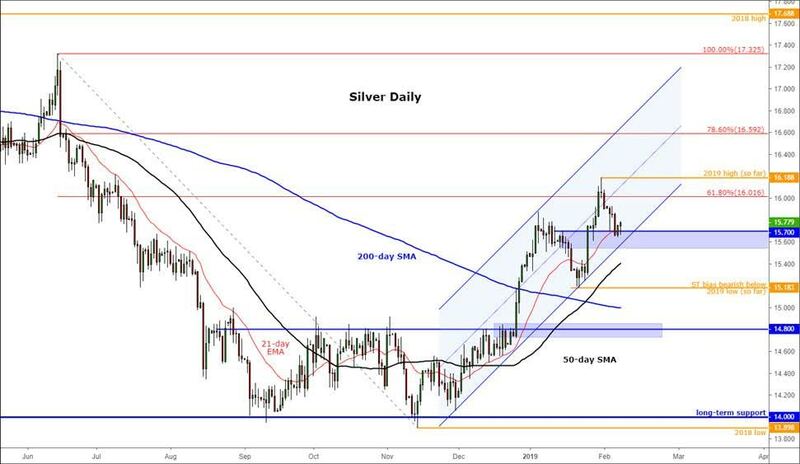 Meanwhile the technical outlook on silver continues to improve from a bullish point of view. It was important that the metal held long-term support around the $14.00 handle towards the back end of last year. Now we are seeing a gradual rise above this pivotal long-term area. Thanks to the renewed bullish momentum, the moving averages that I normally have on my charts are now in the "correct" order for silver: 21>50>200. Crucially, price is evidently finding support from the 21-day exponential moving average, which means we are progressively seeing shallower pullbacks, thus confirming the bulls are gaining control. So, as things stand, the path of least resistance is clearly to the upside for silver (and gold). We will remain bullish on precious metals until and unless the charts tell us otherwise. In the short-term, we will only drop our bullish bias should silver break its previous low around $15.20, or forms a distinct reversal pattern at higher levels first.